The Diamond Crown of Bulgaria is a royal regalia (along with the Sceptres of Ferdinand I and Boris III), that existed during the Bulgaria monarchy from 1878 to 1946. The crown originally belonged to Queen Marie Antoinette of France. It was given to Princess Clémentine of Orléans as a dowry together with a golden carriage also belonging to Marie Antoinette. 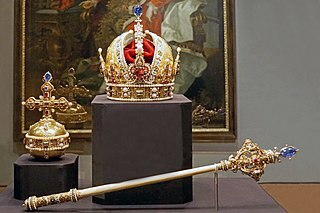 Both of those items ended in the possession of the Bulgarian Royal Family. The carriage is currently on display at the Sofia History Museum. The original top of the crown was replaced from the French Fleur-de-lis to the Bulgarian boll with a cross on top of it. 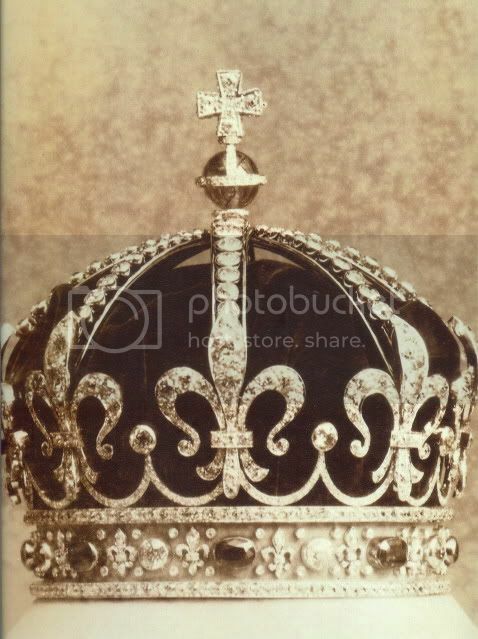 The crown was first used by Princess Marie Louise of Bourbon-Parma on her wedding to Prince Ferdinand I. It later passed to and was used by Ferdinand's second wife, Princess Eleonore Reuss of Köstritz. The current whereabouts of the crown is unknown. Ferdinand I, born Ferdinand Maximilian Karl Leopold Maria of Saxe-Coburg and Gotha, was the second monarch of the Third Bulgarian State, firstly as ruling prince (knyaz) from 1887 to 1908, and later as king (tsar) from 1908 until his abdication in 1918. He was also an author, botanist, entomologist and philatelist. Princess Maria Luisa of Bourbon-Parma was the eldest daughter of Robert I, the last reigning Duke of Parma. She became Princess-consort of Bulgaria upon her marriage to Ferdinand of Bulgaria, the then prince-regnant. She was the mother of Tsar Boris III of Bulgaria. Louis Rudolph, a member of the House of Welf, was Duke of Brunswick-Lüneburg and ruling Prince of Wolfenbüttel from 1731 until his death. Since 1707, he ruled as an immediate Prince of Blankenburg. Duke Alexander of Württemberg was a member of the dynasty which ruled the German kingdom of Württemberg. To marry a daughter of the French king he agreed that their children would be raised in their mother's faith, thereby becoming ancestor of the Roman Catholic branch of his family. The Bulgarian Monarchs used the titles: Khan, Prince (Knyaz), Tsar and King.